← Are Bert and Ernie a gay couple? This entry was posted in Richard Hunt and tagged Jessica Max Stein, Mark Hamill, Richard Hunt, Star Wars, The Muppets. Bookmark the permalink. I am really looking forward to Funny Boy! It’s so exciting to hear you have interviewed so many people from Richard’s life for it. 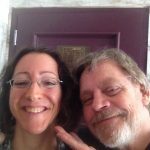 I was pretty happy when Mark Hamill tweeted about Richard a while back (as a Star Wars and muppets fan) so it’s awesome to see you got in touch with him to contribute. Thanks for all your work on keeping Richard’s memory alive.